Pros: This is a great access spot for many reasons—plenty of parking, lots of activities and an abundance of soft, white sand. Also, while neighbor to the north Vilano Beach is more cramped due to crowds and vehicle access on the beach, St. Augustine Beach offers lots of space to spread out and throw around a football. Enjoy water sports, fishing, a beachfront splash park for kids, or stroll to one of several restaurants and bars near the pier. Cons: Unless you live in or near St. Augustine Beach, getting to this spot on Anastasia Island may be a trek (especially on busy weekends). Pros: Ponte Vedra Beach isn’t exactly known for its beach accesses, but Mickler’s Landing is a great place to find parking close to the sand, along with restrooms and several outdoor showers. Mickler is known as more of a family-friendly beach spot, so load up the kids and plenty of sunscreen. Be sure to scout for sharks’ teeth; this is a great place to find them! Cons: While Jacksonville’s beaches boast soft, sandy shores, the sand is a bit more rough and “shelly” at Mickler. Due to recent hurricanes, Mickler also suffers from erosion problems, which are currently being remediated. 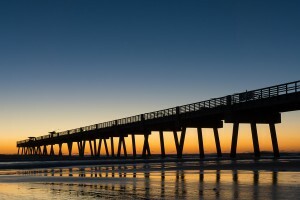 Pros: Unlike many of the smaller access points throughout Jacksonville Beach, the pier offers a large parking lot, which can save time when sharking for a space on a Saturday. There are also two public restrooms for beachgoers in the vicinity (at the 5th Avenue parking lot and a few blocks south at 2nd Avenue), as well as outside showers to wash off the sand. Cons: This spot gets pretty busy and can get a little raucous on weekends, particularly in the afternoons. Mornings are best for families and those seeking relaxation. Pros: Neptune Beach is known for two things: good surfing breaks and almost no parking. Town Center is a good option because it offers plenty of parking and an easy walk to convenience stores, restaurants and shops. Because Neptune Beach is a little less crowded than Jax Beach to the south, this spot is popular for water sports enthusiasts (and people-watchers alike). Cons: Due to its positioning, the Town Center area can get pretty crowded. Get there early to beat the throngs of beachgoers dragging their coolers and beach chairs. Pros: Fort Clinch offers easy access to the sand and a pristine, quiet beach as well as clean restrooms and outdoor showers to wash off sand. Its seclusion makes it an ideal place to set up a family umbrella and relax for the day without crowds and noise. The park also offers lots of biking and hiking trails, camping and access to the 18th century coastal fort. Cons: This access is the only one on the list that isn’t free. Visitors pay $6 per vehicle. Beachgoers also need to head out by sundown when the park closes. Much like St. Augustine Beach, Fort Clinch is a trek for those who don’t live close. Bonus Beach Tip: Instinctually, many of us turn right when we hit sand and begin looking for a spot. Instead, turn left and you’ll likely find fewer people, and better real estate for your beach chair. Looking for other beach access points near you? Check out http://www.dep.state.fl.us/cmp/beachaccess/default.htm.